The Old Bro Network: Bruins celebrate National Championship #109 !! Bruins celebrate National Championship #109 !! Thanks for all of your hard work (and for creating the old bro network). We need to schedule another all hands get together. A fellow Bruin sent me the Donation information below. UCLA Baseball gets relatively limited funding and given the recent Natty Championship, they deserve more. I thought it might be relatively easy for you to send this out to the group. It is an easy way to donate money directly to the Baseball team (or to any particular team, or in general to the athletic department). On June 25th, 2013, UCLA Baseball captured its first national championship, and the unprecedented 109th NCAA title for UCLA. We would like to take this opportunity to respectfully ask loyal UCLA Alumni, Friends and Fans to support Coach Savage and our baseball student-athletes with a financial gift that will directly impact their program. 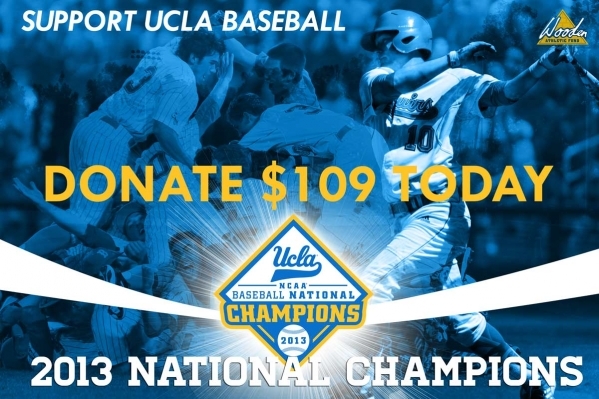 While gifts of any size will assist in UCLA Baseball defending their title in 2014, in honor of UCLA’s 109th NCAA National Championship, we are asking for you to make a tax-deductible gift of $109! As we strive to provide both coaches and student-athletes with the best resources possible to continue our tradition of excellence, we rely heavily on generous individuals such as yourself. Thank you for your consideration of making a gift of $109 today and GO BRUINS! Trying to make the gift to the baseball team but the web site click through is not operational - can't enter a dollar amount and can't advance to next page without the dollar amount. Anyone having same problem? Mr. Bay, can you alert the UCLA folks on this issue? Tried with both my PC and my iPad.